That’s why I want to do a special series this week. We are about to learn together how to turn a house into a home on a thrift store budget. One of my co-workers, Alison, has agreed to be our featured makeover. Alison only has $250 and three days to take her den from drab to fab. And since I’m really no help at all in this area, I’ve invited my sweet friend, Myquillyn Smith (also known as The Nester), to do this fun decorating project with me and my team. You don’t want to miss our thrifting and sifting and wandering through all kinds of fun places! I think you’ll find some simple ideas that you can easily incorporate into your own space. And the best part? You won’t break the bank. Not even close. 1. Go with an open mind. Don’t walk in looking for a 20-inch green leather ottoman. Instead have a general idea of things you could use like a wooden chair, a lamp, a large decorative vase, etc. 2. Ask yourself, “If this was in Anthropologie would I love it and want to buy it?” If the answer is yes, you should buy it now! 3. Look first at size, shape, condition and function of items. You can usually change the color and fabric if you like it. 4. Don’t expect to find something every time you shop. Grab a drink from Sonic and just enjoy the process of looking through the items. If I can hit five stores in one day, I usually (but not always) end up with a few interesting items. 5. Start small and work up to bigger risks. Don’t buy the $150 dresser from the thrift store in hopes of refinishing it if you’ve never tried it before. Instead, start with the $7 night stand. What’s the worst that can happen? You hate it and lose $7. But if it works?! You now have a nightstand you LOVE for just a few dollars; this is SO worth the risk. Isn’t Nester so smart and adorable? 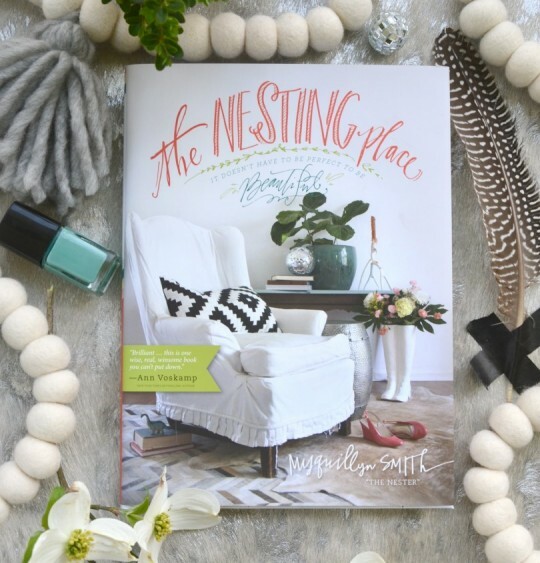 You will absolutely want to get her book, The Nesting Place. Click here to purchase your copy! You’ll find it chock-full of great tips, beautiful pictures from Nester’s home, and sweet perspectives teaching “it doesn’t have to be perfect to be beautiful.” You’ll feel right at home reading it. Today, I’m giving 3 commenters a signed copy of The Nesting Place. To enter, leave a comment below telling me which friend you plan to invite to join us here on the blog this week. Be sure to check back tomorrow for more decorating tips and to see the exciting progress on Alison’s room makeover. I would love to read this. I have an incredibly hard time spending any money decorating my home and really don’t know where to start. I would love to read this. I have an incredibly hard time spending any money decorating my home and really don’t know where to start. I will invite my friend Becca. I am going to invite my college room mate. We graduated in 1984 from Carson Newman college but are still close. I will invite my daughter! My friend, Becky, has a knack for garage sale finds that turn into cozy home decorations. She’ll love this! I will share with my friend Kay. Excited to follow the decorating ideas on video and would love the book! I would love to read this! My house has gotten out of control over the years. When our kids were small it was comfy and happy and now it is chaos and I hate it! I need some ideas and some help. This would be terrific. Thank you for sharing with us. I really want this book!!! Thank you for the opportunity to win a copy while I save to buy it! If I would be so lucky to win a copy of your book, it would help motivate me to change my son’s old room into a new guest room. He is grown now with a family of his own and lives an hour away and I have yet to change his bedroom from a twin bed-night stands with lamps-computer desk-teenage boy’s-room. Help! This looks like a fabulous book!! I would bring my daughter and best friend, Mya! She is just 13 years old, but is my right-hand gal when it comes to all things home and decor. We are not only thrift store (and side of the road!!) hunters, we both love to decorate our new, little home. Built in 1901, it’s a charming little house 400 feet from the ocean. Quirky and cute, your book would give us more ideas on how to pull it together! I will invite my sister Nicole. I’m inviting all 3 of my roommates at USC! We are moving into our first house in August, and we have been discussing how we should try to tackle the daunting task of decorating. I would love to have this book sitting in our living room coffee table as a finishing touch to our newly decorated home! I’m going to invite my sister Rhonda. Sounds like a fun book filled with tons of inspiration to better our home. This is such a terrific series of posts with The Nester!!!!!! Also you are so great in the videos. Do you do public speaking for a living? I would love to win a copy of Myquillan’s book. Thanks! What a wonderful way to reuse & repurpose! I would love to share this book with my sister. We both need it & love to shop garage sales, flea markets, etc together but usually leave empty handed because we don’t want to end up with more junk. Love this book! I am inviting g my friend Donnette to join us here this week. She is a thrift store shopper (and good at it I might add) so I think she will love learning from Ms. nester! I will invite my daughter/s. I live for Thrift Store shopping and have found many good treasures that I have added to my home and yard. I’m always up for new ideas on hope to repurpose and use different things. Looking forward to reading your book. I love the Nesting Place site. I will invite my sister-in-law, Pam, to follow the series. I just retired from teaching and we bought a little cottage down south to spend time there in winter. I want to learn to repurpose and decorate on a budget. It’s always been a dream of mine and now I have the time. Your book sounds perfect for my new start.